4 zettabytes (4 billion terabytes) of data generated in 2013, 44 zettabytes predicted for 2020 and 185 zettabytes for 2025. These figures are staggering and perfectly illustrate this new era of data deluge. Data has become a major economic and social challenge. The speed of processing of these data is the weakest link in a computer system: the storage system. It is therefore crucial to optimize this operation. During the last decade, storage systems have experienced a major revolution: the advent of flash memory. Flash Memory Integration: Performance and Energy Issues contributes to a better understanding of these revolutions. 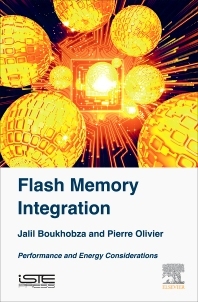 The authors offer us an insight into the integration of flash memory in computer systems, their behavior in performance and in power consumption compared to traditional storage systems. The book also presents, in their entirety, various methods for measuring the performance and energy consumption of storage systems for embedded as well as desktop/server computer systems. We are invited on a journey to the memories of the future. Pierre Olivier is a postdoctoral researcher at Virginia Tech, USA. His research is focused on operating systems and storage performance as well as energy consumption.